Maternal and Infant Nutrition and Nurture …oh my! 10 things I learnt and loved about #MAINN2014. This conference is usually held each year in Grange-over-Sands in the UK, by the University of Central Lancashire. It is a conference dedicated to presenting and discussing research on infant feeding with an emphasis on alternative, contextual approaches to the subject. This year it was held at the University of Western Sydney in Parramatta. These are some of my personal highlights…in no particular order and with ruthless editing to make it digestible to others. Thanks to Virginia Schmied from UWS for making it happen. 1. Exploring the highs and lows of the Baby Friendly Initiative with Fiona Dykes from the UK and Danielle Groleau and Sonia Semenic from Canada. Good to know that there are people interested in the way that health professionals (midwives) live with the 10 steps and the culture of the accreditation. Fiona spoke about the problems with a “top- down”approach with any behaviour change, but also about the promise of relationships in breastfeeding support. Sonia spoke about the challenges of introducing the 10 steps into NICU units worldwide: there is a general pre-occupation with infant growth, calories and volume. There are also significant challenges associated with baby illness and feeding. It will be so exciting to see the progress with this work. Danielle’s work looked at the varied impacts that BFI facilities seemed to have on women’s breastfeeding behaviour in the longer term. She highlighted the need for more research into the impact of BFI on women from low income groups. She also spoke very clearly about the sociological theory that shines a light on the the problematic issues of breastfeeding cessation amongst women from low income backgrounds and breastfeeding in public. Symbolic capital…mmmm. 2.Renee Flacking reporting on her ethnographic study of four NISC units: 2 in Sweden, 2 in UK. eleven months of fieldwork (phew!). Her comparison of the different models of care was effective in demonstrating the many benefits of the “womb” model: continuous skin to skin with mother (and/or partner), a separate, private space that allowed families to “focus within”, with the baby as the context. Interactions between mother and baby “effortless”. Importantly, parents can “be who they are”. Her description of the “standard” nursery care with one uncomfortable chair for mama highlighted the culture in many nurseries of parents being expected to stay an hour or three, but not for longer. 3. Investigations of the impact of peer support for breastfeeding in the UK with Gill Thomson. Nursing Mothers and the Australian Breastfeeding Association have done this en masse in Australia over the past 50 years. Yup, we reckon it works. Kate Mortensen from ABA is investigating breastfeeding peer support globally and the RUBY study (Ringing Up about Breastfeeding) will examine the impact of telephone peer support for breastfeeding mums in Melbourne, as presented by Heather Grimes from La Trobe University… it’s already under way. 4. Shanti Raman’s ethnographic study of families in Bangalore,India: “nothing special, everything is normal”. How pregnancy and childbirth is part of the discourse of everyday life in India, and how it is woven into the rich repertoire of celebration and ritual. This resonated with my own experience of providing care for Indian families in Australia… somehow enviable in our culture where pregnancy and childbirth seems so “other”. 5. Gold star to Charlene Thornton for making me like stats! Her “normal woman” enables effective comparison between care models. Some juicy details: C/S rates, inductions and episiotomy in private compared to public. 7. Examination of the breast pump discourse: Helene Johns, Kath Ryan and Athena Sheehan. Soft touch indeed. The impact of advertising culture on breastfeeding culture: when breastfeeding comes to equal breastmilk. 8. Talking at meal breaks. To anyone and everyone – so friendly! What is it about people who do research into breastfeeding and birth? I’d like to think we are uncorrupted by wealth or status! 9. Meeting strangers at dinner. Actually, turned out to be new friends. This was the kind of conference where, no matter who you spoke to, they were interested and involved in breastfeeding research and/or clinical practice. Often both. I found out a great deal about what breastfeeding support looks like in Queensland. I also was delighted to share my own plans for research (thanks guys!). 10. Being at UWS in Parramatta. Home of the Whitlam Institute. The campus is an oasis from the traffic and noise of the bustling city. It’s also a stunning combination of old architecture and new as well as useable and attractive open spaces. An amazingly culturally diverse community in Parramatta and a calm and beautiful walk each day along the beautiful Parramatta river. Harbour? Who needs a harbour?! The Mead Johnson company was particularly aggressive in its pursuit of medical clients for its baby formulae. This relationship was described as “enlightened self-interest and co-operation” between the manufacturer and the medical profession. The challenge of making baby formula part 1. When physicians in the US decided at the end of the nineteenth century to put their minds to making safer infant formula, they really threw themselves into the task. Rima Apple’s history of infant feeding in the US: Mothers and Medicine, describes the complexity of the task of modifying cow’s milk to make it ok for little babies. Possibly for many many years, cow’s milk was diluted with water as a simple substitute for breast milk. From what I can gather, it seems like most babies would have had as much breastmilk as could be obtained from mother or other(? ), with top-ups of cow’s milk or combinations thereof. The almost official medical view was that most women were incapable of producing an adequate breastmilk supply, and that most breastmilk was of dubious quality (diet, exercise and sweetness of temperament were essential ingredients for ideal milk production). The solution was to offer a cow’s milk substitute. Sound familiar? I can only guess that the ill effects of tiny babies drinking raw watered-down cow’s milk were usually counteracted by the benefits of whatever breastmilk they were also receiving. Or not. In some US cities in the 1890’s more than one third of babies died before their fifth birthdays. Somewhat complicating this was the widespread public view that bottle feeding was indeed dangerous for babies. Understandably, there were concerns about the bacterial load in cow’s milk that arrived in urban centres from rural areas: raw, unrefrigerated and in open vats. Customers were often seen to take a sip of milk from the dipper to check for freshness and even home delivery of cow’s milk saw the milkman using the same dipper to fill household vessels (clean or cleanish) for every household on his delivery route. The milkman delivers! So began campaigns to make cow’s milk safer for everyone: promotion of home pasteurisation, legislation that meant lids for milk vats were compulsory, milk stations positioned in urban centres with quality control standards and educational pamphlets for mothers…. and eventually, refrigeration for transport vehicles carrying cow’s milk. But the real science was in the way cow’s milk was changed to suit a baby human’s digestive system. Complex percentage systems of adjusting the cream and water and milk sugar were devised by physician Thomas Morgan Rotch. He also added lime water (calcium hydroxide) to make the rather acidic cow’s milk more suitable for baby’s digestion. For family doctors and paediatricians he recommended a chart be used that had 30 different combinations of cow’s milk formulae for babies up to 12 months old. Mothers were expected to consult regularly with their doctor for feeding adjustments in their baby’s first year. Ironically perhaps, this multitude of different concoctions was designed to reflect the way mothers’ breastmilk varied over time. And breastmilk continued to be recognised as the best way to feed a baby.But if there was difficulty with breastfeeding, there was little medical understanding of how problems could be remedied, part from offering bottles. Rotch was influential in his work, but ultimately public health officials demanded simpler systems of devising baby formulae. Importantly, the medical profession insisted that they be the first point of contact for guiding the mother in feeding her baby. Manufacturers of baby milks or modifiers usually encouraged this too, or at least with some of their milk products. 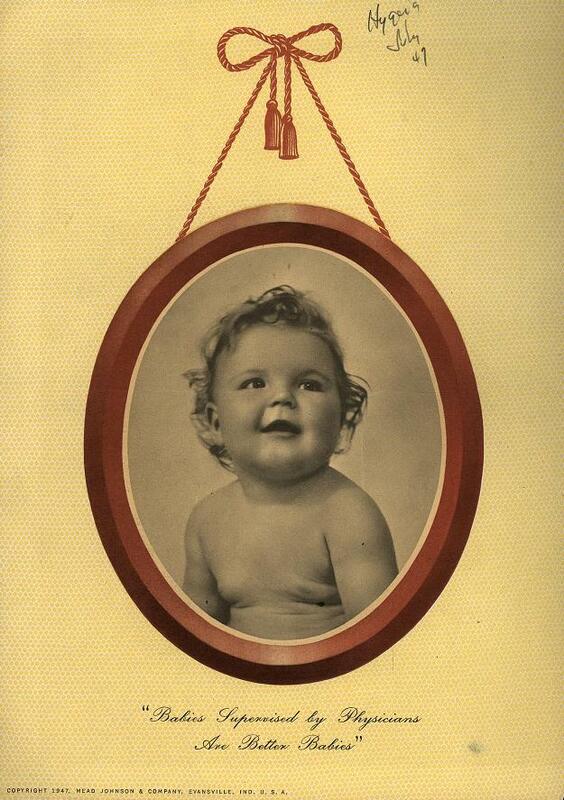 I’ve just spent a good many hours reading a book about the history of infant feeding in the USA. It has been interesting to learn about the way breastfeeding was viewed at the end of the nineteenth century, just as artificial baby formula was being developed. Although this is definitely a history of the US experience, we can allow reflections on breastfeeding in Australia where many broad cultural themes were similar, such as the role of science and medicine in everyday life, and the lived experience of women. The “cult of true motherhood” or the “cult of domesticity” described how women were viewed in the latter part of the nineteenth century: women were defined by their role as mothers, and were entirely responsible for the well-being of their children. Kind of nice to have the recognition, but at times it would have been a tough load to carry. 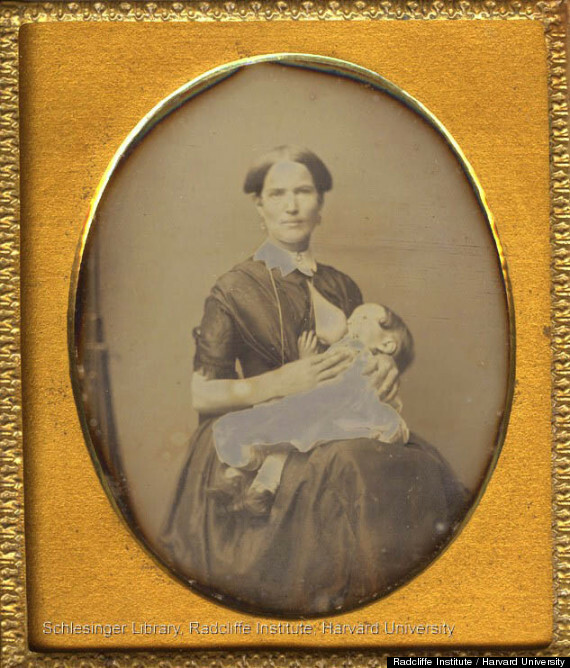 In the nineteenth century in the United States, breastfeeding was generally seen as the best way to feed a baby, but the lactating breast was also seen as a sensitive and unpredictable organ: milk supply could be effected by anything from a “fretful temper” to a “fright”, and breastfeeding was likely to overtax the mother’s well-being, causing a “general weariness and fatigue”. Lactating women were encouraged to eat well, exercise a little and cultivate a serene disposition(!). Go on…breastfeed…just make sure you do it perfectly. Oh, and good luck. The second best way to feed your baby (should your unpredictable breasts not do your asking, despite your serenity) was for another woman to feed your baby. But wet-nursing was also problematic: how to ensure that this woman from the working class would be eating well, maintaining some serenity and not wasting her precious milk on her own infant? Never mind the enduring view of character being conferred by a baby’s food source. Infant mortality rates were alarming, criticism of wet nurses widespread. The medical and scientific solution to the problem was to further develop baby formula. Bottle feeding was seen as a thing able to be manipulated by science, unlike the vagaries and uncertainties of that most female of activities: lactation. 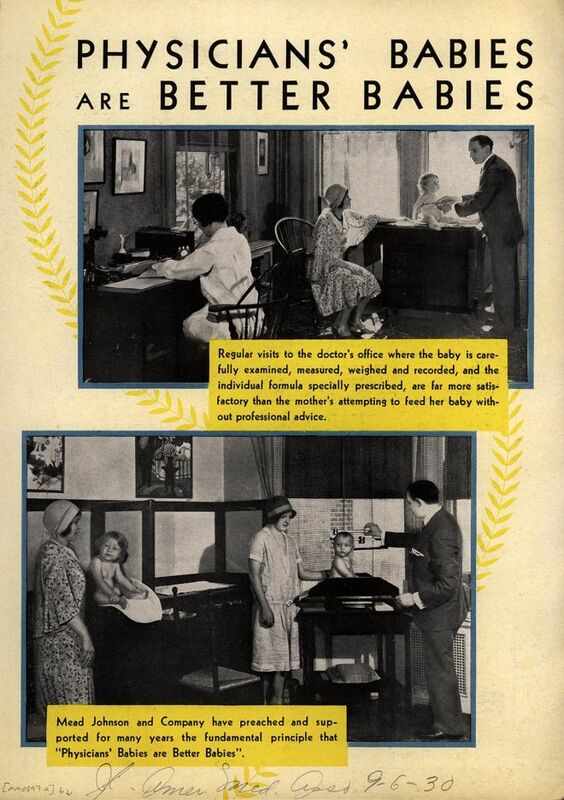 And so began an era of medical advice for infant feeding. While mothers were very special people who were expected to take responsibility for their children’s upbringing, they would need a little bit of help from medicine if breastfeeding wasn’t working. That help would be in a bottle of baby formula, perhaps suggested by a doctor qualified in the newest of medical specialties: paediatrics.